Each power conductor connects to a turbine-powered generator inside the dam itself. Let’s go inside the dam now and look at one hydro generator to see how power is produced. The water from above the dam flows down through pipes called penstocks. Each pen-stock has its own head gate at the top to stop water flow for maintenance or during an emergency. At the end of the pen-stock is the scroll case. This curls around the turbine like a snail shell. 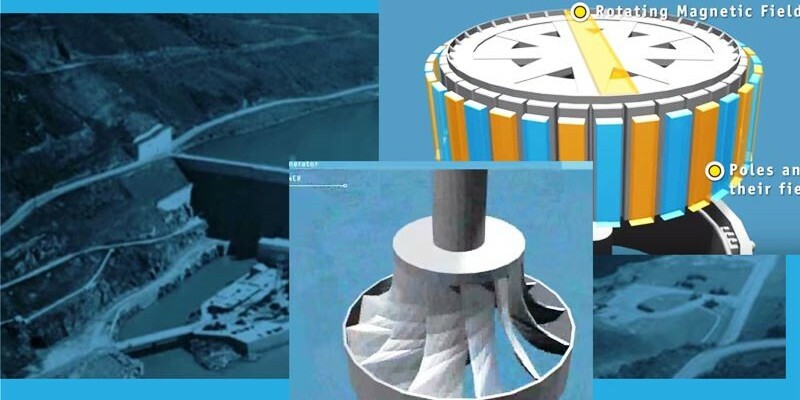 It’s designed to create a consistent pressure of water entering the turbine from all sides. Inside the scroll case is a set of vanes called the wicket gates. These control how water flows into the turbine. The wicket gates are controlled by an external ‘governor’ system. This opens and closes them in response to conditions on the national grid. A high load on the system slows the turbine. The governor system reacts by opening the gates further to speed it back up. Conversely, it will narrow the wicket gates in response to low load on the system. Beyond the wicket gates we can see the turbine blades. The blades are shaped to extract the most possible spin from the moving water. The turbine blades and the shaft connecting them to the generator are called the ‘runner’. We will expand this into its parts so we can see them clearly. At the top is the ‘exciter’, which gets a small DC power supply from a cable attached to an external controller called the automatic voltage regulator or the AVR. Below the exciter is the generator. The inside is a rotor, turned by the runner. The outside stationary part is the stator. This is made up of a set of three coils of copper wire, called ‘windings’. On the rotor are a number of electromagnets, powered by the DC current from the exciter. If these are switched off, the turbine will be able to spin without generating any electricity. The magnets’ poles on the outside of the rotor create a separate rotating magnetic field for each magnet. The magnets are lined up so that adjacent poles always have opposite fields to each other – north, south, north, south. As the rotor spins within the stator, each pole’s magnetic field acts on the stator’s windings. Each time a pole makes one full revolution, one pulse of AC power is generated in the windings and transmitted towards the grid by conductors attached to the stator. Because the stator is connected to the grid, it’s important that the pulses are in time with the grid frequency. When the pulses are in time with the grid frequency, we say that the generator is synchronized. System conditions can ‘push’ the stator’s magnetic fields out of sync with the rotor. The difference between the movement of the stator’s magnetic field and the rotor’s is the torque angle. The rotor has many electromagnets on it, producing a consistent flow of power. The generator produces three-phase power by using different conductors to carry the power generated along different parts of the stator, as shown here. This creates a three-phase alternating current, which is represented by the sine wave.